Is This The 2015 Corvette Z06's Supercharged Engine? Amidst all of the hullaballoo over the 2015 Ford Mustang, GM held an embargoed briefing Thursday that covered the details on the 2015 Corvette Z06. As you might guess, we didn't go, but now some info on its engine may have leaked out. Is the Z06 going supercharged? 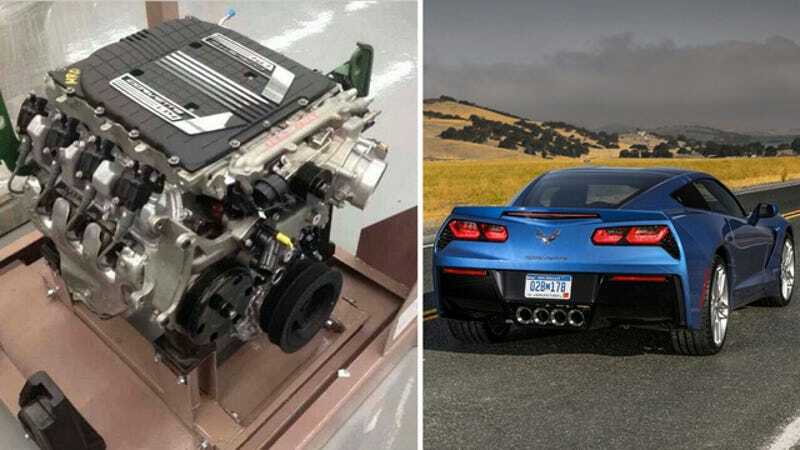 Both GM High Tech Performance Magazine and parts manufacturer American Velocity Performance posted pictures on social media of a supercharged V8 engine purportedly called the LT4. And by "purportedly," I mean "written on the engine cover." This isn't the first time it's been reported that the Z06's motor will use that name. Like LT1, the engine in the Corvette Stingray, LT4 is a revived name from GM's past. The previous LT4 was last seen on cars like the Corvette Grand Sport, Chevrolet Camaro and Pontiac Firebird from the 1990s. The big news here is that it seems to be blown. So if this is true, then forced induction will be coming to the next Z06, which has so far been naturally aspirated, unlike the top-level ZR1. Any theories about this? How much power will it put out? And if anyone attended the closed Z06 meeting yesterday and feels like hooking us up with some details, feel free to do so in the comments.